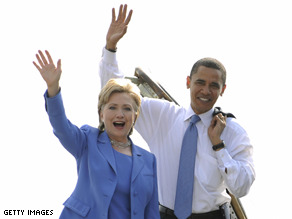 Obama and Clinton made a public display of unity last month. (CNN) - It was just over one month ago Hillary Clinton and Barack Obama made a much-hyped public display of unity at a New Hampshire campaign stop. But more than 30 days later, the New York Democrat has rarely been seen at Obama's side, and she's only attended a handful of events on his behalf. The reason for her ostensible absence from the campaign trail? She has an important day job, said her former campaign chairman Terry McAuliffe. "Since that meeting in Unity, New Hampshire, the Senate has been in session," McAuliffe told MSNBC Monday. “I've tried to get her to travel and do a couple of events. And she hasn't been able to do those yet." Still in an election year where many Democrats feel so much is at stake, Clinton's relatively minimal public campaign role to date has been noticeable. It also comes amid continued resistance from many of her former supporters towards Obama's candidacy. Despite choreographed and carefully produced pictures of the two former rivals standing side by side last month, many of Clinton's top donors have yet to sign checks over to Obama, and some have even openly said they may not vote for him. According to a CNN/Opinion Research Corp. poll released earlier this month, Clinton supporters who say they plan to vote for presumptive Republican nominee Sen. John McCain are down from a month ago, but those who say they plan to vote for Obama are also down, and a growing number say they may not vote at all. But McAuliffe, one of Clinton's most aggressive supporters during the prolonged Democratic primary race, said the New York Democrat has been working vigorously for Obama behind the scenes, and is about to assume a more public role in the campaign. "I don't like to relay conversations between Senator Obama and Senator Clinton - I know they have an extensive travel schedule for her," he said. "The requests have been piling up. Hillary Clinton has done more in her position of anybody that has come in second before. She's been working. She's been making calls. As soon as she gets done with her senate deals, she's going to hit the campaign trail." Meanwhile, an Obama source tells CNN's Gloria Borger Clinton will hit the trail for Obama in three or four battleground states next month. "She will do anything she can to help Barack Obama become the next president," he added. GOD WILL LET IT BE IF HE WANTS WITH OR WITHOUT PUMA OR GUMA OR EVEN SHUMA HAVE FAITH IN GOD YOU ARE SEEING THE BIBLE FULFILL THE STONE THAT THE BUILDER REFUSE SHALL BE THE HEAD CORNERSTONE , TH MEEK SHALL INHERIT THE EARTH. OBAMA THE NEXT PRESIDENT OF THE GREAT USA.